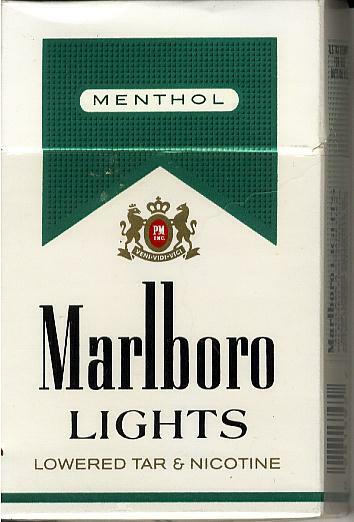 Marlboro Menthol Lights – Selected premium tobaccos. American blend in flip top box. Firm Filter – Cooling Taste. Marlboro Menthol Lights. 20 menthol cigarettes. 9 Mg Tar and 0.7 Mg Nicotine. All Marlboro cigarettes sold in store are Non-FSC. Marlboro Menthol Lights (They are called “Marlboro White Mint” in Finland, because of the new name law), are one of the best-tasting menthol out there. They are fresh and of mediocre strength. They got a nice buzz to them, definitely worth trying! These are a great light menthol cigarette. the only downside is the price but you get your money’s worth. Thus far, quality is good, most of the time. Problems: tobacco tends to be loosely packed, and sometimes the cigarette paper is split open. Removing the plastic wrapper can be ridiculously difficult. These are manufacturing problems that could easily be corrected with quality control. Packaging and shipping service are excellent. This company sells good cigarettes.